Updated snowfall outlook for a winter storm that is expected to arrive in New Brunswick, Nova Scotia, and Prince Edward Island tomorrow morning. A winter storm moving up the Eastern Seaboard will travel up the Bay of Fundy before crossing Prince Edward Island into the Gulf of St. Lawrence on Wednesday and into Thursday morning. 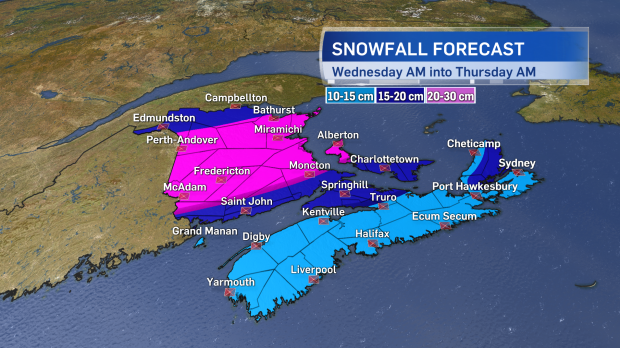 Heavy snow and blowing snow is expected through much of the day for central and northern New Brunswick. Southern New Brunswick, Prince Edward Island, and Nova Scotia will also see an extended period of snow and blowing morning and early afternoon before ice pellets and rain mix in. Most of the inclement weather clears Wednesday evening with lingering flurries in the forecast for Thursday. 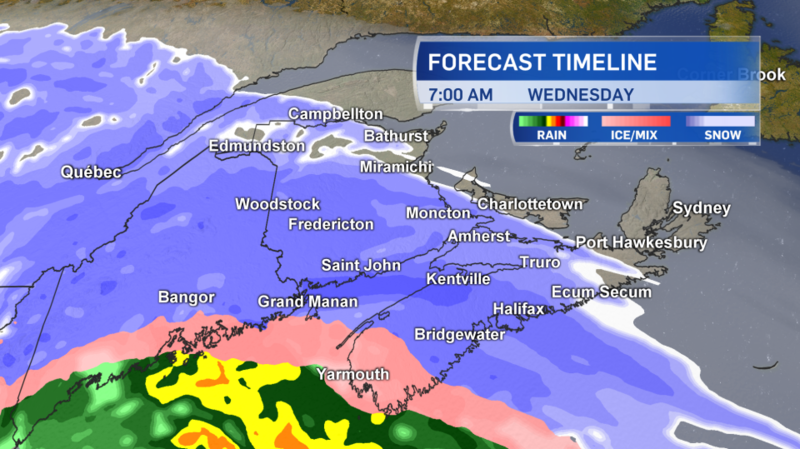 Most of New Brunswick and Prince Edward Island can expect 15 to 30 cm of accumulation in snow and ice pellets. Most of Nova Scotia will get 10 to 20 cm in snow and ice pellets with the higher amounts in northern and eastern areas of the province. A winter storm warning has been issued by Environment and Climate Change Canada for those areas expecting the heaviest snow and ice pellet accumulation. The warning spans New Brunswick, PEI, parts of mainland Nova Scotia (Cumberland, Colchester, Pictou, and Antigonish counties) along with Cape Breton. Blowing snow advisories are in place for the remainder of Nova Scotia and wind warnings have been issued for Digby, Yarmouth, and Shelburne counties as well as northern Inverness County. Easterly winds will increase in strength Wednesday morning into the afternoon. For most, gusts will peak between 40 and 70 km/h with exposed areas of the coastlines closer to 80 km/h. The coastline of Digby, Yarmouth, and Shelburne counties will hit peak gusts 80 to 100 km/h Wednesday morning. Northern Inverness County will experience peak gusts near 120 km/h Wednesday evening and night. The winds are strong enough to drive blowing and drifting snow which will reduce visibility. The winds will turn west and northwest Wednesday night and Thursday morning. Cold air returns in those winds so slushy or wet surfaces will ice up on Thursday. Due to the combination of snow, ice, and winds expect poor conditions on the roads for much of Wednesday. Airport and ferry services should be monitored in the event of delays and cancellations. This map shows which parts of the Maritimes can expect what type of precipitation and when.